Think Caesar's final moments in Rise Of the Planet of the Apes could have done with a little more bloodshed? So did the original script — read the real ending to the Apes reboot, and find out who died! This past weekend at the Visual Effects Society Production Summit, Fox's president of post-production, Ted Gagliano, announced what really happened to James Franco in the end of their film. Will Rodman (James Franco's character) was saved from death in a last minute reshoot, filmed only weeks before the movie's release date. He said Franco flew from North Carolina to California over July 4th weekend to shoot an alternative goodbye with the ape Caesar (Andy Serkis). "We shot for three hours and (Franco) was back on the plane," Gagliano recalled, adding that this change led to a challenging final weeks of what was originally a 41 week post schedule that involved extensive visual effects work. The film opened Aug 5. This actually makes lots of sense, since Franco had the highest name recognition on the project. Allowing his character to live opens up room for him to return in the sequel. And you know there's going to be a sequel the box office numbers were just too good to pass up on some more Ape Bucks. 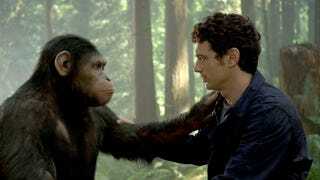 In the theatrical ending, Franco and Cesar hugged it out in the woods. Cesar choosing his monkey pals over his human family and ending the flick atop a tree. But what really happened? The Playlist got their hands on the original script which shows Franco taking a bullet for his Ape brother. Read the rest of the script excerpt over at The Playlist. So, which ending did you like better? And should Franco be allowed to live on in a sequel (assuming he wants to come back)?